★ Higher Efficiency: 150mA lighting-absorbance area ensures the solar panel fully charged within 4-5 hours for the cherry blossom string lights. Unlike other marked capacity, our solar battery is real to 600mA which can work 12-14 hours. ★ Solar Powered Christmas Lights: No electricity required, charged by sunlight. It is safe, cost efficient, energy saving and environmental protection with long lifespan. This solar string lights will automatically turn on in the dark and turn off during the day. 2 lighting modes from flashing to steady for various lighting effect. Easy installation because of no wiring required, just stick the stake into the ground or mount the solar panel on the wall. ★ Waterproof: Ideal for outdoor and indoor. The decorative blossom flower lights can be used in the wall, window, floor, balcony, background, hanging on the backdrop or stage drapes, the bedroom, concert, club, hotel, dancing hall, fashion show, backyard and other occasions. ★ Specification: Cable: 10m/33feet, Leading wire: 2m/6.5feet; Total length: 12m/39.5feet; Light distance: 10cm/0.33feet; LED quantity: 100pcs. Package Content: 100LEDs lights, 34pcs cherry blossoms, Solar panel, 1 set of Stake, Manual, Packing bag and Packing box. 90 Days 100% Satisfaction Guarantee and Our Friendly Service – 24 hours email customer service response. ★ Wide Application: This solar cherry blossom Christmas Lights can decorate a romantic and cozy environment for your loved at Valentines’ Day, Festival, Halloween, Easter day or Party. 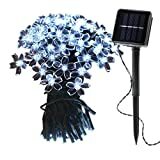 Solar Powered Fairy Flower Lights: No need to plug in, saving much electricity and trouble of replacing battery; Portable and convenient, cost-saving. High Bright LED: Energy saving, Environmental protection and long lifespan. Waterproof: IP44, ideal for outdoor and indoor as solar patio string lights, but not into the water. Easy Installation: You can DIY this Christmas sakura String Lights to different style. Wide Application: The starry sakura lights are perfect for garden, patio, Christmas tree branch, bush, roof, eave, fence, hall, stages, courtyards, path, seasonal decoration, icicle, rope, gazebo, camping, lantern, ambiance, bistro, events etc. The charging effect is depended on the sunlight absorbance affected by the weather, season, places, etc. The solar powered garden Light will light up automatically at dusk and turn off in the daytime. Turn the garden string light on and set the mode before charging, so it will light up at dark. The solar panel should be installed in a well-lit area where it can receive maximum sunlight. Excessive exposure in rain, snow or shadow will be decreased or avoided.